In 1996 the School of Church Communications at the Pontifical University of the Holy Cross in Rome was begun. Already then, the University saw the advisability of organizing an international forum for directors of communication offices of dioceses, bishops’ conferences, religious congregations or institutes, and new movements in the Church, that is to say, a conference for the same kind of professionals studying in the new School of Church Communications. The forum sought to bring together those responsible for communication in the Church and help them to reflect on their task and how to better carry it out in service of the Church. Its goal was to help them be better communicators and to grow in their knowledge and love for the Church. Thus arose the Professional Seminar for Church Communications, which takes place every two years in the central building of the University. In April 2016 the tenth session was held, with more than 400 spokesmen and women from all over the world taking part. Participants usually include several bishops, many priests and religious, along with a majority of lay men and women who work in various offices of communications. The diversity of the institutions represented is an external manifestation of the rich variety of the Church. But what is most noticeable is the underlying harmony and family environment that marks the seminar. Over the years, this gathering has been gradually becoming more international. From the Netherlands, directors of communications from most of the dioceses now usually take part. Also present are a good number of directors of communications from dioceses in Italy, the United States, Portugal, Poland, Spain, Mexico, Argentina, Brazil, and other countries where the Catholic Church has an important presence. An enriching perspective is also provided by those who come from countries in which the Church does not have a strong presence, such as Norway, Estonia, and Denmark, where the need to awaken a new curiosity about Christianity is evident. Or from other countries where, besides finding themselves in a minority, Catholics are suffering persecution, as in some countries in the Middle East. Participants from the younger Churches in Asia and Africa also make an important contribution and are an inspiration for those who live in more secularized countries. Professionals from other Christian denominations also often take part. For example, in the most recent seminar the secretary general and the director of communications for the United Methodist Church in America were present. They gave a paper on how to dialogue better, through the social networks, with young people who sense spiritual concerns. Their suggestions referred to a challenge common to all Christians: to go out to meet others where they are and bring the Gospel to them. Those attending also often include alumni from the School of Church Communications at the Pontifical University of the Holy Cross, who now hold positions of responsibility in their respective dioceses or institutions in places as far-flung as Tanzania, Ukraine, the United States, El Salvador, Croatia, Liberia, Indonesia, Switzerland, Spain, Romania, Germany, India, France, and Colombia, among others. The ten seminars held up to now have all had a common thread: furthering the work of offices of communication in support of the Church’s evangelizing mission. A culture of encounter is fostered that helps people to find God through debates and conversations in public opinion and the media. The task of the Church communicator is thus seen as helping to overcome misunderstandings and clear away obstacles to the catechetical work of Christians. One of the basic questions in all the seminars is how to foster a public dialogue on the faith that is attractive and creative, while also being faithful to the perennial message of the Gospel. This dialogue requires going beyond the “institutional” aspects of the Church and stressing the key elements of the Christian faith. The most recent Pontiffs have been an effective guide in this regard, and therefore stress is placed on lessons that can be learned from Pope Francis, Benedict XVI, Saint John Paul II and their predecessors. This year, for example, one of the speakers spoke about “guidelines from Pope Francis” on how Christians should be present in the social networks. He cited the Pope’s words: “Access to digital networks entails a responsibility for our neighbor whom we do not see but who is nonetheless real and has a dignity which must be respected.” Another suggestion of Pope Francis is that we need “to choose our words with care” when communicating on the internet; and that, in the social media, “we can and we must judge situations of sin—such as violence, corruption and exploitation—but we may not judge individuals, since only God can see into the depths of their hearts” (Message for Fiftieth World Communications Day, January 24, 2016). Speakers often include well-known figures from the academic and professional worlds, from both civil and ecclesiastical entities. For example, specialists have spoken about topics such as brand management, entrepreneurship, media training, publicity, the use of television, and story-telling, with valuable lessons for every communicator, including a Church spokesperson. Each year there are also plenary sessions with well-known speakers from the ecclesiastical milieu. The first seminar, for example, featured Cardinal Jean-Marie Lustiger, from Paris, who died not long afterwards in 2007. In 2014, the opening session was presented by Cardinal Timothy Dolan. He passed on seven lessons he had learned in his interactions with journalists since being named archbishop of New York. One of these was the importance of professionalism: “Church communicators,” he said, “should make our own the best and highest professional standards.” The video of his presentation can be found on the YouTube channel of the Pontifical University of the Holy Cross. In 2016 special recognition was given to Archbishop Claudio Maria Celli, who presided for more than a decade over the Pontifical Council for Social Communications, and to Father Federico Lombardi, former director of Vatican Radio and spokesman for Pope Benedict XVI and for Pope Francis until 2016. They were given a statuette of St. Catherine of Siena, Patroness of the School of Church Communications, in gratitude for the assistance they have provided the seminar over the years. Fr. Lombardi spoke about some of his most vivid experiences alongside Benedict XVI and Pope Francis, and shared some key advice for communicators. The first and most obvious rule is never to fail to speak truthfully. “While maintaining proper reserve and discretion, we can never say what is false.” Only “if we are in the service of the truth can we enter into relationship and dialogue with others.” This talk of Father Lombardi is also available on the University’s YouTube channel. Much of the seminar involves parallel activities. Each participant can thus choose the activity that he or she finds most interesting. For example, in the most recent seminar a session on the experiences of Catholic Voices coincided with a session on how to take advantage of beatification and canonization ceremonies to communicate a message. In the first, Jack Valero, Austen Ivereigh and other international coordinators of this initiative imparted a special session on media training, while in the second session, the recent beatifications of Archbishop Oscar Romero in San Salvador and that of Bishop Alvaro del Portillo in Madrid were analyzed. Besides the main presentations, panel discussions were also offered on topics of special interest today, including the family, marriage, the beginning and end of life, immigration, etc. There were also other working groups in which journalists, Church communicators, and academicians shared ideas with one another on various topics: practical experiences on the management of communications during the Pope’s trips, means of confronting certain crises, use of “big data” in the work of an office of Church communications, etc. An opportunity is also offered for the sharing of experiences by those attending. St. Josemaría Escrivá insisted that spreading the Christian message is never anti-anything nor anti-anybody. He followed St. Paul’s advice: “Do not be overcome by evil, but overcome evil with good” (Rom 12:21), which he paraphrased as “drowning evil in an abundance of good” (see Furrow, no. 864; The Forge, no. 848). This intuition of the saint who inspired the Pontifical University of the Holy Cross was one of the keys to the positive tone given to this professional seminar in its first twenty years. Thus positive experiences in one country can serve as an example for those from other countries, with the needed cultural adjustments. For example, a session was given by Tom Peterson, founder and president of Catholics Come Home, an organization that runs campaigns directed to those thinking about returning to the Church. In a session several years back, Tugdual Derville, president of a well-known French pro-life association, explained the communication keys of La tournée Bioéthique. This movement, started by lay people but assisted by authorities in the Catholic Church, among others, has fostered a significant cultural change in the country and has brought into focus in the public sphere fundamental human values, doing so in a joyful and attractive way. Rafael Medeiros, from Brazil, shared with those present the experiences of Project Comunicação Aberta, which makes available to the media Catholics with adequate preparation to speak about significant events, such as a trip of the Pope, a canonization, or an important Vatican document. He gave as an example the encyclical Laudato Si’, which gained solid and widespread media coverage. The experts provided appeared in the principal newspapers and television programs in the country. A spokeswoman for the English bishops’ conference, Margaret Doherty, explained the communications approach taken for the day the Church dedicated to members of religious orders. The testimony of a young nun who spoke about her vocation to the contemplative life was made available to the national television stations. It had great communicative impact and generated a broad public conversation about the beauty of the Christian faith and the meaning of life. A commemorative day that seemed destined to go unnoticed gained national relevance, simply by offering an attractive and readily available testimony. priesthood. Patricia Ryan and other promoters of the website www.foryourmarriage.org and the campaign What Have You Done For Your Marriage Today? spoke about this service sponsored by the Bishops Conference of the United States. It seeks to encourage married people, through publicity campaigns and other means, to carry out small daily actions that strengthen their married life: preparing morning coffee, smiling at one’s spouse more frequently, providing small household services, sending an affectionate message, etc. Experiences of this kind are very abundant: informative actions that have worked well, successful videos on some aspect of Christian life, courses of formation for religious communicators, initiatives for evangelization through art, formative experiences on the social networks, and many more. After each seminar, a volume is published that gathers together the principal presentations and a selection of the communications. Ten of these volumes have already been published, and provide a wealth of useful experiences for those beginning to work in this area. At the end of the conference, Bishop Javier Echevarría, Prelate of Opus Dei and Chancellor of the Pontifical University of the Holy Cross, met with all those who wished. He personally greeted a number of the people there and addressed some word to everyone. 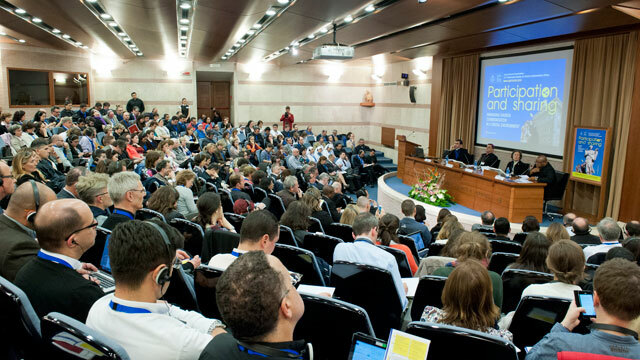 “The Gospel is the communication of God’s happiness, said the Prelate of @opusdei in #churchcom16.” This was one of the tweets sent out by the account of @iMission, a Catholic organization that fosters the presence of Catholic content on the web. The religious who founded it were at the conference and spread some of its content via their official Twitter account. And he helped them to consider something that every Christian experiences in the work of evangelization: “Christ began the Redemption in a small corner of the world. So it makes no sense to think: what importance does what I am doing have? A lot of importance, a lot. What Christ came to carry out on earth is being repeated. From a tiny corner of the world, he was already redeeming. Therefore don’t fail to see the importance of your ordinary life. Fill it with joy, with supernatural meaning, and with communicating God’s truth. Romana, No. 62, January-June 2016, p. 148-159.